We know that the Ford Mustang GT350 is a fire-breathing monster of a muscle car producing 529 horsepower from a flat-plane crank V8 and a remarkable 8,250 RPM rev limit. But did you know it has holes in the exhaust tips? If you’re thinking they’re for exhaust gases or fluids or even for a thermodynamic function, you’re wrong. It has nothing to do with the engine whatsoever. This happens when, after a session out on the track, the Mustang’s hot tires become sticky like a piece of flypaper and begin to pick up all the little pebbles and gravel on the road. The tires naturally fling them towards the rear fascia and those exhausts tips that are not totally connected to the actual exhaust. Without those drain holes, the rocks and pebbles would rattle around in there. You can imagine, especially with this car, how annoying the sound of a rock or pebble trapped in that exhaust would be. So what did the engineers who worked on the best Ford Mustang of all time come up with? A few holes drilled into the exhaust to let them fall out on their own. Brilliant. 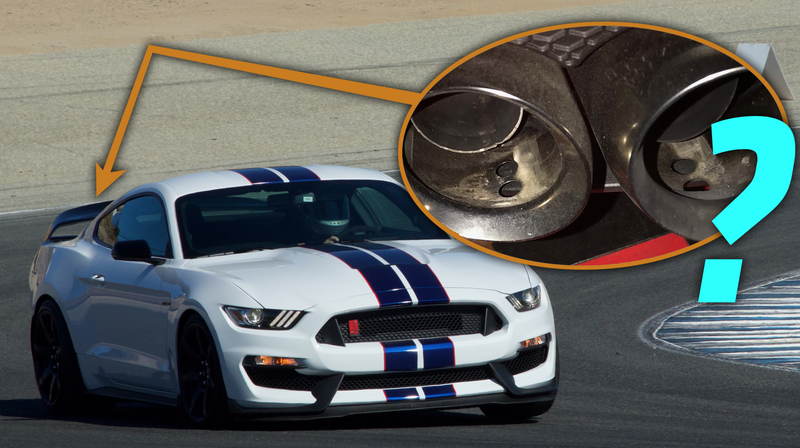 I think Ford missed out on a huge opportunity by not putting “rock drainage holes” as a prominent feature in the GT350's brochure.